I hope your New Year has started bursting with freshness and new energy. 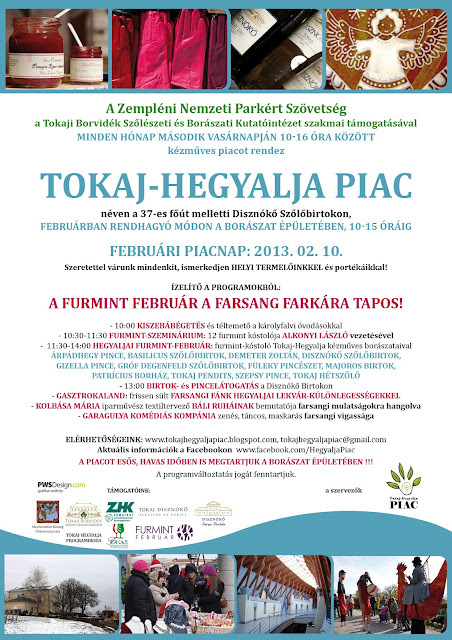 The team of Market organisers here in Tokaj-Hegalja, northern Hungary are certainly enthused and excited about what this year will bring us all. We have set up a great new programme for the monthly markets in 2013. Just as last year, each has a theme to inspire us, our producers and of course visitors, as well as help us all to connect better to the seasons around us. We're starting on February 10th, the month of carnival and, in Hungary (and the Tokaj Wine Region in particular), of the distinctive Furmint grape. This grape variety has been the main variety in the region since its introduction in the 17th century. Perfectly suited to the climate and susceptible to Botrytis (the noble rot), Furmint retains wonderful acidity making it the main backbone for most of the legendary Tokaji Aszú wines to this day. Not only that, the grape also acts as a mirror to the terroir, thus allowing the volcanic minerality to be reflected in these wonderful wines. As well as a tasting with some outstanding winemakers, distinguished wine writer and Tokaj expert László Alkonyi will lead a Furmint tasting seminar. A fantastic opportunity to find out more about these local wines and the grape variety that is their key. I will give times and the list of winemakers in the next post - and it is an impressive sight. All bodes well for the tasting indeed - not to be missed! Carnival - time to dress up! See what ideas designer Mária Kolbása has to offer. And a conversation with Mária (also the force behind superb soaps of Paturin) about design in life. Carnival time is also the time to start the fast. And what better way to start than with doughnuts cooked freshly by the Sárga Borház served with jams made by our very own producers! Yum! Well, the market is before "Pancake Day" and the real start of Lent. Let us bid farewell to winter together! We will be joined by the nursery children of Károlyfalva who have a long-standing tradition of burning a straw man as they get ready for spring coming hot on the heels of winter! And of course there will be music too - as always! But for a change - and in case it's too chilly/snowy/windy - the market will be in the impressive winery building of Disznókő. Designed by leading organic architect, Dezső Eckler, it is a superb example of modern architecture fused with the traditional. Use of natural materials and light make the building unique - and a pleasure. So the market is a great opportunity to experience it for yourself. 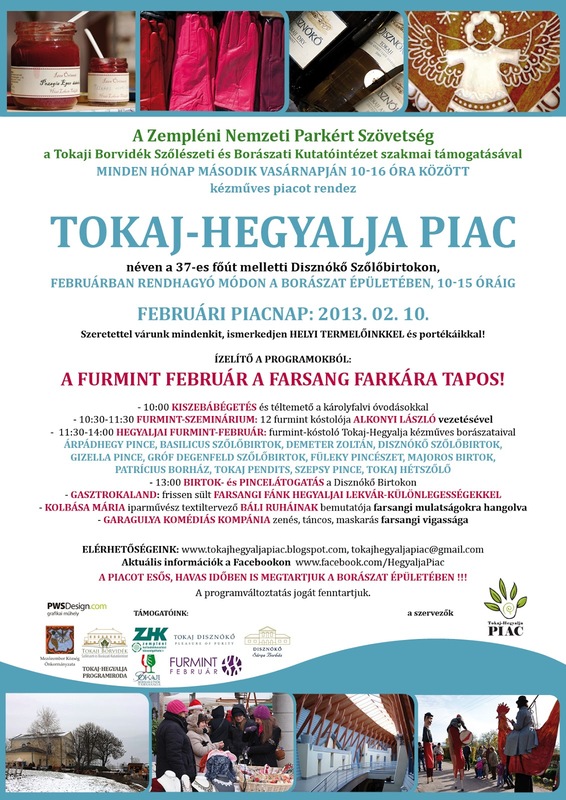 We hope you can join us on Sunday February 10th at Disznókő.